A Tale Of Two Christmases? Surging US demand is offset by European woes for container carriers. US ports have never been busier. In China-to-Northern Europe long-term freight rates for 40-foot containers jumped by 65 percent. Peak season is fast approaching for container carriers and Xeneta, the leading global benchmarking and market intelligence platform for containerized ocean freight, predicts it could well be a tale of two Christmases. Xeneta, which crowd-sources real-time global shipping data from a community of over 700 leading businesses, covering more than 160,000 port-to-port pairings, has charted an eye-catching recovery for the container segment in 2017. US ports, it says, have never been busier, while in September Xeneta data revealed China-to-Northern Europe main port long-term freight rates for 40-foot containers had jumped by a staggering 65 percent year-on-year. However, the notoriously fickle sector is in flux yet again, with, as Xeneta CEO Patrik Berglund remarks, decidedly mixed fortunes on the horizon. “We are now entering THE most important period for both the carriers and the global retailers they service,” he said, noting that, traditionally, retailers earn between 25 and 40 percent of their annual sales in November and December. “High consumer confidence and strong job growth in the US bodes well for the industry, with shops intent on stocking up for the expected Thanksgiving-Christmas rush. 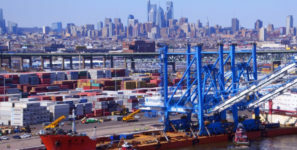 The Washington DC-based National Retail Federation has forecast US container imports to grow by as much as 13 percent year-on-year in October. Demand is impressively strong, but in Europe it’s a different story. Berglund says the impacts are already being seen. Maersk, he notes, recently decreased capacity on its Asia-Europe routes by 10 percent, while both the CKYH and G6 Alliances have each cut one of their Asia-European runs, reducing eleven weekly sailings to nine. In addition, industry reports point to the fact that carriers are reducing vessel speeds to save fuel costs, some by 10 percent – suggesting that margins are now so fine that every cent saved makes a difference. These actions will, Berglund says, help maintain rates and create the appearance of a still healthy market. However, this is merely a short-term fix in the hope that broader economic factors will eventually correct the supply/demand balance. But, of course, there is no guarantee of when that will happen. With access to over 35 million contracted rates, Xeneta’s data shows that, in the period mid July 2017 to end of September 2017, short-term rates for a 40-foot container on the Asia to main European ports declined from $1880 to $1633, a fall of some 10 percent. Contrast that with developments in the US. Here the short-term rates, across the same period, climbed from $1430 to $1611, an increase of 13 percent.